Responding to the humanitarian consequences of the conflict in Syria: have we failed the test? Why is Syria a seemingly impossible environment to operate in? What approaches are working – and what innovative ways of working can be explored? Have humanitarian agencies failed the test in Syria? These questions were explored in the event "Responding to the humanitarian consequences of the conflict in Syria: have we failed the test?" 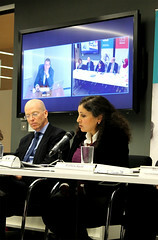 which was hosted by the Humanitarian Practice Network to launch the 59th issue of the Humanitarian Exchange on the conflict in Syria. 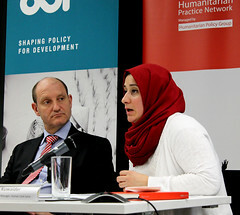 The challenges of operating in Syria, and providing life-saving aid to populations in need, was a key point of discussion, with panellists emphasising the lack of security, bureaucratic measures – "Kafkaesque and Orwellian in equal measure" observed panellist Ben Parker – the number of armed groups and what ICRC’s Sean Maguire described as the "fluid nature of power and authority" in the country. Are these challenges simply too much for the humanitarian community to overcome? The current way of operating hasn’t worked, claimed Ben Parker, arguing that the technocratic tools that the humanitarian system brought to Syria were not up to the job. "Where we are now in Syria was not difficult to predict, but it's much worse than we had anticipated" he said. International and media focus has also failed to reflect the full extent of the situation, with chemical weapons, and the removal thereof, seen as more important than the thousands of civilians under siege and facing starvation. "Starving children should be a red line just as much as chemical weapons are a red line", argued Marwa Kuwaider of Human Care Syria. Panellists questioned whether the focus on addressing the issue of chemical weapons may have drawn attention away from the other aspects of the humanitarian situation, with Ben Parker noting that UN chemical inspectors were quickly given access to certain areas in Syria to which UN humanitarian agencies had been refused entry for many months. In the face of mounting challenges, Matthew Wyatt, the head of the Syria Crisis Unit in the UK Government’s Department for International Development (DFID), emphasised the need to be innovative in both the response in Syria and for refugees in neighbouring countries. The role of local or diaspora organisations, such as Human Care Syria, was highlighted as having a key role to play in the response, not least because they have greater access to affected people within Syria than large international NGOs.Ben Parker suggested that in many circumstances the ‘amateurs’ had proven more effective than the ‘professionals’. Sean Maguire emphasised the need for complementarity between actors, stressing that while more needs to be done through local groups, given the magnitude of needs, there is still a need to support large international NGOs who can work at scale. However, the key to resolving the issues in Syria remains a political one. "The law won't provide the solution in Syria. There is no way of going around state consent in the law," said Emanuela Gillard, a Senior Research Fellow at the Oxford Institute for Ethics, Law and Armed Conflict, University of Oxford. "Syria is tragically stuck between some very large opposing forces", said Ben Parker. Humanitarian organisations were called to bear witness and highlight the needs of Syrians across the country; Marwa concluded, "It is the role of humanitarian actors to sway public opinion on Syria; this has been our greatest failure to date".